How can a patio add protection without reducing light? A family from Greenhills in the Adelaide Hills came to us with a specific request. They wanted a patio to be built on to their house, with a roof that was flat and would let in plenty of light. A patio that would provide year-round entertainment and relaxation opportunities for all the family, while keeping harsh sun out and letting diffused light into the patio and the back of the home. Brian Rohan from our Outside Concepts Eastern Branch took on the task with his usual gusto. While standard installations are Outside Concepts bread and butter, we also take on plenty of non-standard jobs. The resultant patio is not only beautiful but perfectly meets the family’s needs. It was built with a low-maintenance Colorbond Firmlok structure and Palram 18mm thick twin wall sheets on the roof. The twin wall sheets are virtually unbreakable, feature an attractive hammered glass texture and offer excellent insulation properties. Most importantly, the roofing sheets come in a range of profiles – including flat – and allow a soft, diffused light to enter the space. 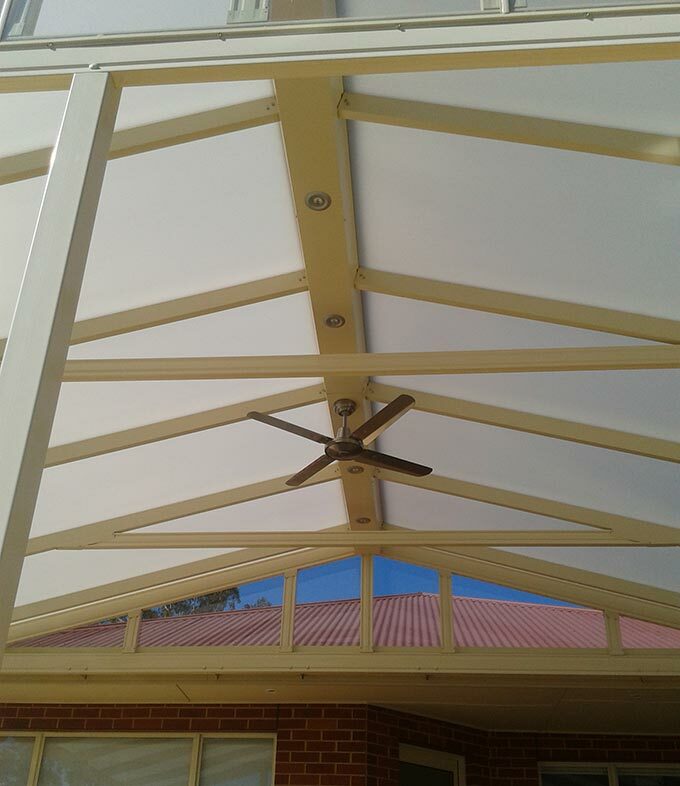 The patio also features flashing between the top purlins, to allow installation of downlights and a fan, and 3mm clear plastic PVC gable infills. Outside Concepts builds great things. Call now for a free quote: 1800 601 674.